In an era of instant communication, the old-fashioned stamp still has a huge following. More than 50,000 people are expected to attend theWorld Stamp Show in New York, running May 28-June 4. The once-a-decade event includes rare stamp displays like the One-Cent Magenta fromBritish Guiana, which sold in 2014 for a record $9.5 million. “Before the Internet, stamp collecting was a way to learn about the world,” says Ken Martin of the American Philatelic Society, adding that many people now collect for relaxation or investment. 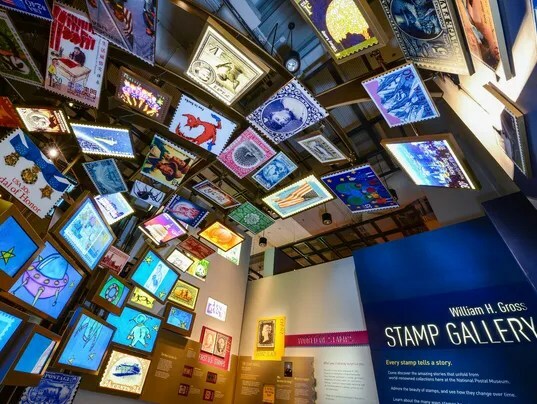 But if you can’t make the show, he shares some favorite stamp sites withLarry Bleiberg for USA TODAY. Norwegian Air faces ever more opposition as it tries to increase traffic across the Atlantic. If you’ve been waiting for Norwegian Air’s deeply discounted flights between Boston and Ireland this summer, don’t pack your bags just yet. Norwegian has been waiting for the U.S. Department of Transportation to greenlight the new route for two years, and while the agency is wrapping up its work this week, it hasn’t said when it’ll make a final decision. What’s the holdup? Norwegian Air, after all, already flies from the U.S. to Europe, via London Gatwick and several Scandinavian gateways, and it also offers seasonal flights from the U.S. to the French Caribbean. But those flights are operated by a Norwegian company called Norwegian Air Shuttle; Norwegian has another subsidiary, based in Ireland—Norwegian Air International—that was set up to take advantage of greater freedoms out of that nation. (Norway is not a member of the European Union; Ireland is.) And it’s this newer company, NAI, that’s the launch pad for a raft of new flights from Irish airports at cut-rate fares and the source of all the ongoing controversy. 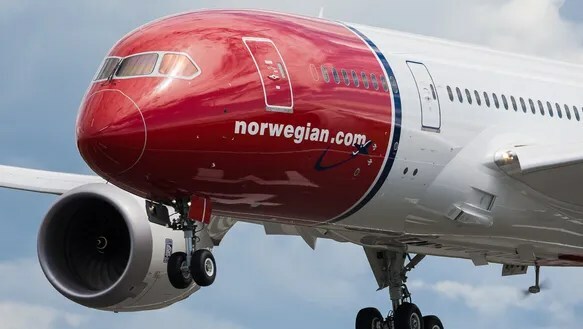 Although the DOT recently issued a tentative decision in favor of Norwegian, a bill opposing the airline has landed in the House of Representatives and is garnering support. Norwegian has struck back, however. “Our opponents have created a wildly inaccurate fear-mongering situation,” said spokesman Anders Lindstrom. “We have filed a document with the U.S. pledging that NAI’s U.S. flights would be operated by U.S. and European crew,” he said, adding that the employees are paid market wages. He also claimed Norwegian already has more U.S.-based crew than any other foreign airline and plans to add additional American crew. With all the heated rhetoric, it can be hard to sort out the facts, but one that’s often cited by Norwegian and its supporters (consumer group Travelers United among them) is that the airline business has become highly concentrated. In fact, the three major U.S. international carriers (Delta, American, and United) and their alliance partners control roughly 80 percent of the airline passenger traffic across the North Atlantic. “The union efforts and claims are totally misdirected and are bad for consumers and the national economy,” said Charlie Leocha, head of Travelers United. Asked by Condé Nast Traveler to comment, a DOT spokeswoman would only say that once all the comments are in this week, there’s no deadline for the agency to act. In other words, super-cheap flights to Europe may not arrive in time for this year’s summer season. Norwegian Air plans to launch nonstop service between Las Vegas and London’s Gatwick airport, the carrier announced Monday. The route would give fast-growing Norwegian its fourth route out of Las Vegas. The low-cost carrier already flies to its bases in Stockholm and Copenhagen. Las Vegas-Oslo flights are set to begin in November. But the Gatwick flights will test whether there’s enough demand for a third carrier to fly between Las Vegas and London. Virgin Atlantic already offers daily round-trip service from Las Vegas to London Gatwick. British Airways flies daily between Las Vegas and its hub at London Heathrow. 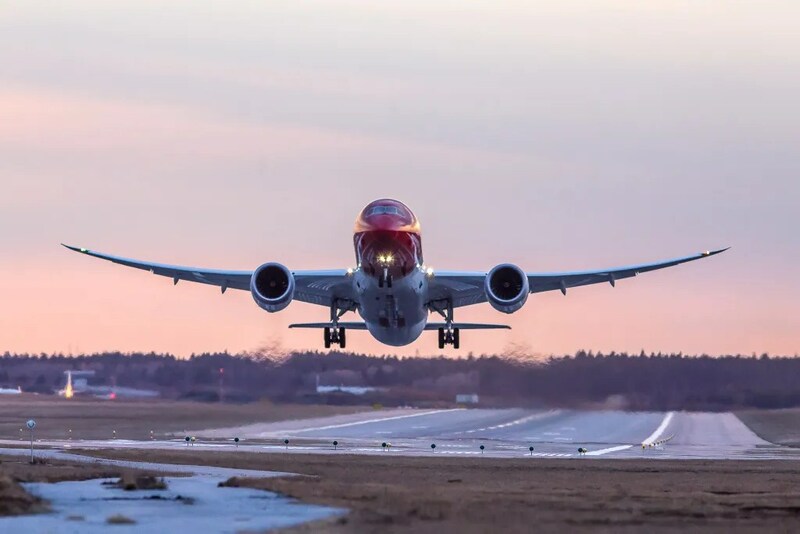 Norwegian would fly two flights a week on the route using 291-seat Boeing 787 Dreamliners. The service starts Oct. 31. While a new era of supersonic airplanes remains a concept, bullet trains are a reality around the world—and they’re getting faster. The world’s fastest train isn’t the newest, the shiniest, or even the one with the most expensive tickets. Charging $8 per person, per ride, the Maglev runs the nearly 19 miles from Shanghai’s Pudong International Airport to the Longyang metro station on the outskirts of Shanghai. That’s right—the train, which takes just over 7 minutes to complete the journey using magnetic levitation (maglev) technology, doesn’t go to the city center. As such, the bulk of the passengers since its 2004 debut have been travelers on their way to and from the airport, cameras out and ready to snap a photo of the speed indicators when the train hits 431 km/hr (267 mph). Shanghai wins again, serving as home to more than just the Maglev. China Railways’ Harmony is the world’s fastest non-maglev passenger train currently in service, connecting Shanghai with Nanjing since 2010. It now counts additional routes of Shanghai to Hangzhou and Wuhan to Guangzhou. Italy’s “red arrow” is Europe’s fastest, capable of shuttling passengers from Milan to Florence or Rome in under three hours. Unveiled during Expo 2015, held in Milan, the train is remarkable as much for its speed as for its construction: its components are nearly 100 percent renewable and sustainable. Spain’s fastest train is the Velaro E by Siemens, and it is used for long-distance services to major Spanish cities and beyond: traveling from Barcelona to Paris can now be accomplished on high-speed rail in six hours. 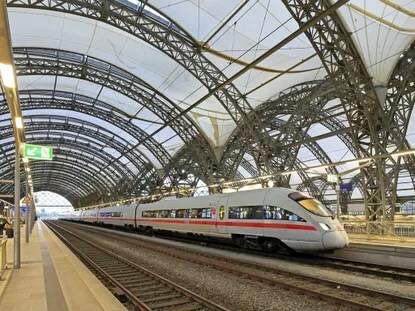 The distinctively futuristic white and silver of the Inter-City Express, or ICE, combined with its sharp red line, makes an impressive sight speeding through scenic German countryside. Similar to Spain’s Renfe AVE train, Germany’s fastest train is another Siemens design, the Velaro D, and was built to fit through the Channel Tunnel. This fact is important as DeutscheBahn hopes to operate these trains in the future from Frankfurt to London. Both the TGV and Eurostar e320 trains are tied for next on the list, but it’s the latter that’s making headlines this year. 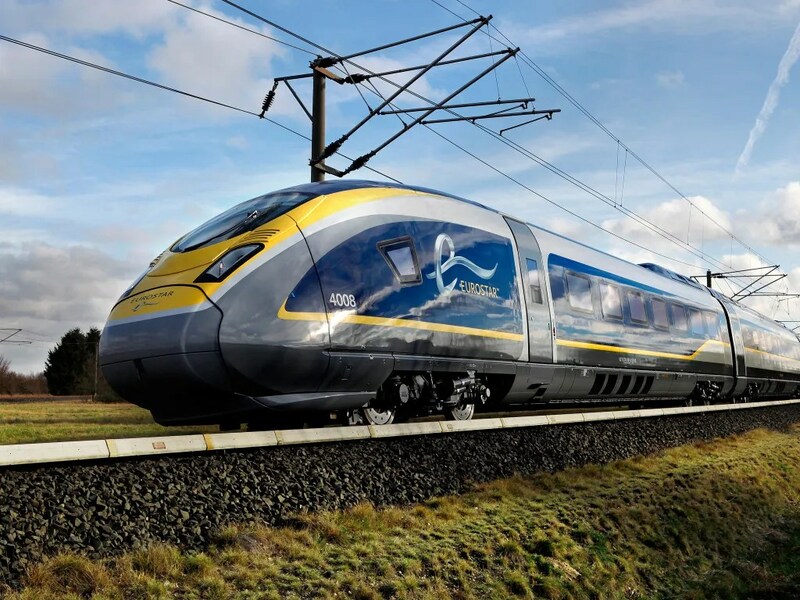 Named for its top speed of 320 km/hr (200 mph), the e320 series is the first tip-to-tail redesign of a Eurostar train in the company’s 22 years. The speedier trains—20 km/hr faster than the earlier, e300 series—are capable of trimming another 15 minutes off the already zippy Eurostar trips of around two hours between Brussels, Paris, and London. 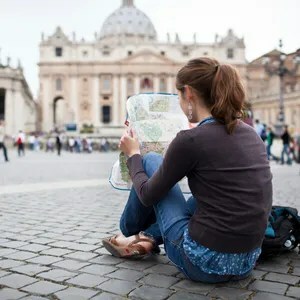 Since Eurostar delivers its passengers right to the center of each city and fares are available with Rail Europe from $70 one-way, it’s a wonder anyone still flies between the cities. Japan is celebrating the 52nd anniversary of high-speed train travel this year, since it was way back in 1964 that the Hikari train launched service between Tokyo and Osaka, cutting travel time between the country’s two largest cities from nearly seven hours to a mere four by rail. The Hayabusa E5 series Shinkansen is one of the newer bullet trains on Japan’s tracks, and so far the fastest in regular commercial service, running fromTokyo to Shin-Aomori at the very north of Japan’s largest island, Honshu. This last March a new extension opened, allowing the route to continue north to Shin-Hakodate-Hokuto on Hokkaido but at a lower average speed of 160 mph. Connecting Amsterdam, Brussels, Paris, and Cologne with multiple daily services, the Thalys is one of Europe’s most important train lines for both leisure and business travelers; in fact, its ridership is almost an even split between the two categories. In December 2015 the German route was extended as far as Dortmund, though the Brussels-to-Paris run remains critical, making up more than half the business. Tickets for the March 2015 inaugural run of this train sold out in 25 seconds, and it’s no wonder when you consider that the line’s debut cut travel times from Tokyo to Toyama and Kanazawa, over the “Japanese Alps” on the other side of the country, from four hours with a connection to just over two hours on a single train. Kanazawa, on the Sea of Japan, escaped damage in World War II and counts historic geisha districts, former samurai neighborhoods, and one of Japan’s most beautiful gardens as attractions. Before the train’s debut it was mostly a beloved destination for domestic tourists, but the E7 Shinkansen is finally showing foreign visitors that there are even more postcard-perfect cities in Japan. America’s current entry in the world of high-speed train travel, the Amtrak Acela debuted in 2000 and hasn’t changed much since, with the exception of adding complimentary onboard Wi-Fi. Its network is restricted to the high-speed rails of the “Northeast Corridor” connecting Boston, New York, Philadelphia, Baltimore, and Washington D.C., and traveling the entire length one-way clocks in at around seven hours due to some speed and infrastructure limitations along the way. By 2020, the west coast will have its own equivalent as Phase One of the California High-Speed Rail project connects San Francisco and Los Angeleswith travel time of two hours and 40 minutes thanks to speeds up to 220 mph. MEMPHIS, Tenn. — While tens of thousands of rib-basters and rubberneckers pig out on porkish pleasures at the Memphis in May World Championship Barbecue Cooking Contest in Tom Lee Park, some 20 miles to the east, in a quiet hotel, a much smaller band of enthusiasts has gathered to celebrate an edible treat that may be appreciated more for its nostalgia value than for its flavor. Jaramillo, 65, is the Cracker Jack Collecters Association president and one of five collectors who haven’t missed a convention since the inaugural event was held in 1996 in Columbus, Ohio — home base of Borden Foods, which in 1964 purchased the snack brand from the private company created by Cracker Jack founder F.W. Rueckheim. In 1997, Borden (now defunct) sold Cracker Jack to its current owner, PepsiCo, a specialist in salty/sweet confections via its Frito-Lay division. But the company’s attempts to update the snack — the prize currently inside boxes contains a QR code so kids can download an app for Cracker Jack video games — hasn’t restored the brand to market prominence or removed the patina of quaintness that clings to Cracker Jack with the tenacity of molasses-flavored corn-syrup on a burst corn kernel. Taking its name from a Victorian slang term that today would be synonymous with “cool” or “awesome,” Cracker Jack hasn’t changed much in 120 years, even as its competition has thrived on gimmicks, sugar-shock levels of sweetness and diversity (Doritos have been marketed in dozens of flavors). These prizes — most of which have been lost forever, due to their tiny size — are the primary source of Cracker Jack collector mania, and their history offers a crash course in American interests and obsessions. “The prizes reflect the era in which they were made,” said Jaramillo, a former research scientist who lives in Fontana, Calif.
During World War II, for example, prizes included toy soldiers, tiny machine guns and miniature propaganda posters (“Loose lips sink ships”). In the 1950s, some prizes had rock ’n’ roll or “space race” themes, while 1960s prizes became “psychedelic” — “Flower Power” buttons, for example. Pre-internet, Cracker Jack collectors were a loosely connected bunch who found one another mostly through the ads in the back pages of various nostalgia and collector’s market magazines. Now, the 100-member association communicates online, with a website and a quarterly newsletter (“The Prize Insider”). Frito-Lay doesn’t offer much help. The company now does little advertising for Cracker Jack, a brand that the New York Times has reported earns about $51 million in annual sales, making it just a bit player in the $11 billion in revenue collected each year by Frito-Lay. The Memphis convention began Wednesday and ends Saturday, after a 9 a.m. to noon exhibit and sale that will be open to the public for the first time in association history. 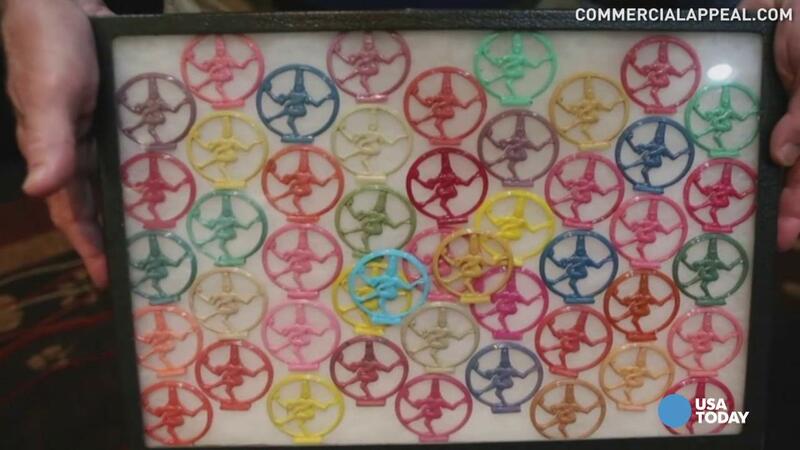 “It’s going to be a nostalgic trip in time for some people, but every age will find something that appeals to them,” said Chicago’s Theresa Richter, 68, a self-described “serious collector” whose home is a “wall-to-wall display” of Cracker Jack memorabilia. But if the prizes have universal appeal, the confection itself doesn’t. Ironically, many Cracker Jack aficionados prefer other snacks. This could be a game changer when traveling abroad. We’ve all been there: You’re standing in a foreign country, struggling to communicate in another language, and kicking yourself for thinking that listening to 20 minutes of “how to speak whatever” on your phone during the plane ride over would somehow get you by. The Pilot, an earpiece being developed by the wearable-technology company Waverly Labs and designed for the international traveler, aims to change all that, so you never get lost in translation again. The ‘smart earpiece,’ as the company calls it, and corresponding app, uses speech-recognition technology to translate in real time, so that two people speaking different languages can have a conversation without missing a beat. Of course, in order for the technology to work, both people need to be ‘hooked up,’ so to speak—which is why the set comes with two earpieces, one for each participant. The idea is that when language gets in the way, both people would put in an earpiece and speak in their preferred tongue. The Pilot will initially be released in European-based Romance and Germanic languages, including English, Spanish, French, and Italian, according to the company’s website. Following the first wave will be other world languages, such as Slavic, Semitic, Hindi, and East Asian. Waverly Labs says that it will begin taking pre-orders through the crowdfunding site Indiegogo this spring, and the mobile app will launch this summer. Earpieces will be available by spring 2017. 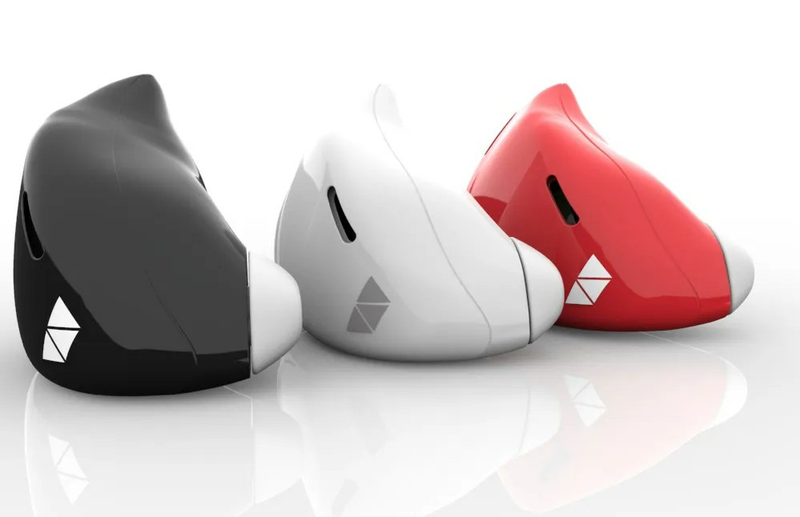 The company says it’s created the world’s first smart earpiece language translator. While prices could change, the earpieces are currently slated to go for $299, including access to select languages. Additional languages will be available via download. On the Waverly Labs blog, the company has also announced a giveaway “as a celebration for our upcoming campaign.” Go to the Pilot’s launch page to enter. Many travelers are concerned about identity theft, worried about a thief using an RFID reader to get their passport info or watching an ATM to steal a pin code. But what about pickpocketing, one of the world’s oldest crimes? It may not merit headlines, but it’s still a threat to tourists in many parts of the world. The old-school “lift” approach can be as devastating to a traveler as the new-school “tech” approach. Here’s a look at five myths about pickpockets. 1. I only travel to countries where pickpocketing isn’t an issue. Preparation for theft is a good idea regardless of where you’re heading. That starts with making photocopies of key documents, such as passports, vouchers, rail passes and even prescriptions, making sure to leave a copy with someone at home. Having a couple of extra passport pictures is also a good idea in case your passport needs to be replaced. You might also want to think about your choice of wardrobe. “It’s an unfortunate fact that when you think about traveling somewhere, there will also be someone who thinks they can take advantage of your visit,” confirms Adam Rapp, founder and designer of Clothing Arts, which makes pickpocket-proof pants and other travel clothing designed to foil common thieves. 2. I’d feel it if someone stuck his hand in my pocket or bag and tried to remove my wallet. It’s highly unlikely that you’ll feel anything. “It is a practiced profession, and like any sleight-of-hand demonstration, employs distraction, misdirection and even compassion to enable success,” Coursen says. 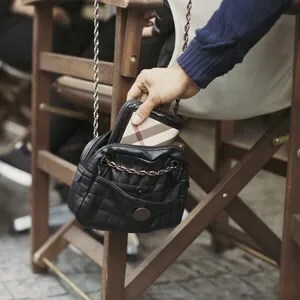 Rapp agrees that pickpockets are very hard to spot and that the theft is almost always discovered too late. There’s every chance that the pickpocket is far more skilled at theft than you are at observation. 3. I always keep my money and passport in an inside pocket. Inside pockets of jackets and front pockets of jeans are all commonly thought of as more difficult to access. But to a trained pickpocket, that won’t make much of a difference. If they target you, it’s more than likely that they’ll get at your valuables. Old-fashioned money belts can be useful, says Rapp, since accessing them is difficult for both you and the pickpocket. They can be unwieldy, but offer a level of protection against pickpockets you can’t get with standard pockets. 4. I always avoid crowds, so there’s not much of a chance that I’ll get pickpocketed. 5. When I visit a new city, I avoid bad neighborhoods. 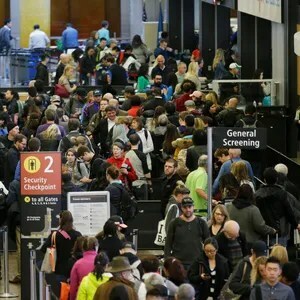 You’ve probably already heard horror stories about unusually long TSA security lines at airports, which may only get worse as the summer travel crush adds more travelers. 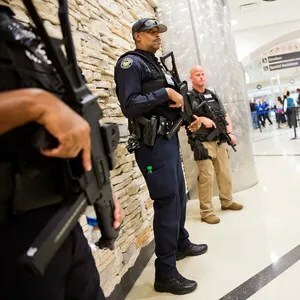 While we wait for the TSA to fix this (mainly by adding more employees and trying to keep the ones they have), here are some strategies to make sure you don’t miss your flight. Get to the airport super early. If you hate waiting at airports this might be a good time to splurge for an airline lounge day pass. American, for example, charges $50 for aone-day pass. Plan to arrive at the very least two hours before boarding for domestic, three to four hours for international. But for some airports, such as Miami when the cruise ships come in, even two hours might not be enough. Perhaps the best advice is to sign up (now!) for TSA PreCheck or Global Entry. I prefer Global Entry because it includes PreCheck and it’s good for five years for a $100 fee. Some premium credit cards, such as the Amex Platinum Card, reimburse the fee. 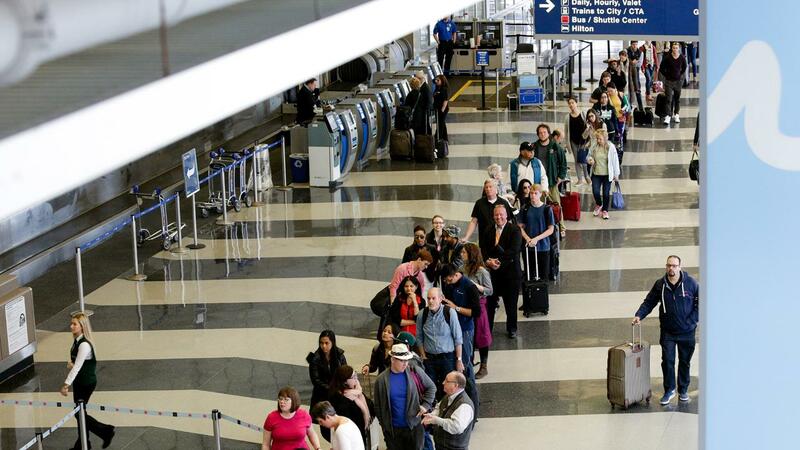 What is TSA’s PreCheck expedited screening program? 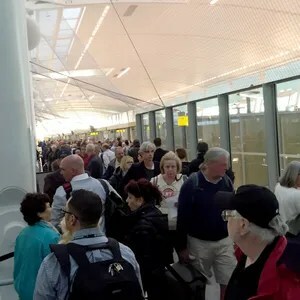 The only problem with PreCheck is that at some airports the special lines are only open for a few hours a day, again because of staffing shortages. 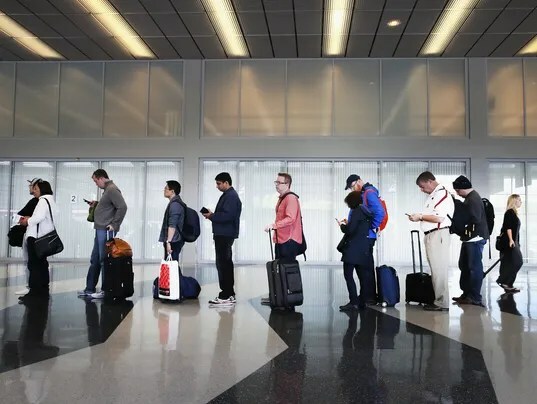 But not only are the lines much shorter than regular TSA lines, you don’t have to take out your laptop and liquids, and you can leave your shoes and light jacket on. Another hack: Buy priority access to TSA lines such as JetBlue’s “even more speed,” which gives you expedited lines through TSA. United has a similar program called Premier Access, which starts at $15. Delta calls it “Sky Priority” and it’s available at select airports. Fly from less busy airports. If you live on Long Island, fly from Islip rather than from JFK, for example. Long Beach usually has shorter lines than LAX, and so on. Try to fly on a Tuesday or Wednesday when airports are less busy. Some times of the day (such as midday) are slower than during the morning and evening rush, so lines should be shorter. If you really want to make your plane on time and you fly Delta, their VIP Select Service is offered at LAX, JFK, San Francisco, LaGuardia and Atlanta. For $250, on top of any Delta fare, you get escorted to the front of the TSA line and even get a transfer between flights via a private car service on the tarmac, plus other VIP perks such as Skyclub lounge access (book via Delta’s VIP phone line at 855-235-9847). American has a similar program but it’s only available to business- and first-class passengers. ROSWELL, N.M. –American Airlines Flight 9780 arrives from Dallas/Fort Worth and taxis past a line of other MD-80 passenger jets as the morning sun rises over the New Mexico desert on a chilly morning this past winter. But as the jet comes to a stop, there’s no boarding gate or jet bridge. In fact, there are no paying passengers aboard at all. The pilots leave the cockpit and head toward the rear of the plane. 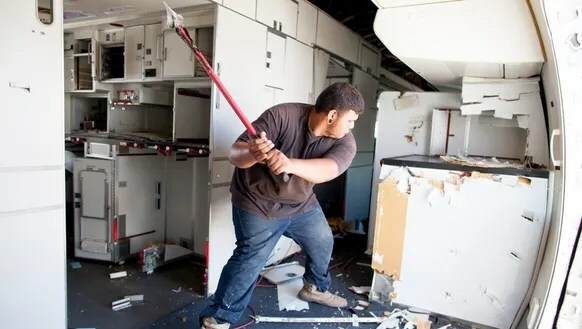 They drop the rear stairs from the 140-seat MD-80’s rear emergency exit, and the flight’s four occupants – two pilots, an American employee and a journalist – calmly descend the steps into the New Mexico sun. Lines of planes stretch for nearly as far as the eye can see. Many bear familiar logos. Most planes are intact – but not all of them. Reams of airplane parts lay strewn nearby across the desert floor. “They affectionately call this the boneyard,” says Martin Testorff, one of American’s aircraft storage managers based here. The “boneyard” is the colloquial term given to aircraft storage facilities where out-of-use planes are sent to be sold, stored or scrapped. Most are in arid locations such as California or Arizona. The one here in New Mexico – officially the Roswell International Air Center – is the preferred facility for American. The Center’s sprawling grounds sit adjacent to Roswell’s tiny airport terminal, where American is the only carrier currently offering regular scheduled passenger flights – three per day to Dallas/Fort Worth and one to Phoenix. But it’s the flow of older, retiring jets that are the real lifeblood of the Roswell International Air Center. Planes can sit indefinitely in storage here, where the dry desert air helps keep the idle aircraft from corroding. Some find second lives, taken in by cargo carriers or by smaller airlines in the developing world. Others face a stark end – raided for parts or scrapped altogether. American isn’t the only carrier to retire its planes to Roswell, one of about a half-dozen such facilities in the United States. Several Boeing 777s from Asian discount carrier Scoot are visible during one recent visit. As is an old Thai Airways Airbus A300 and a Boeing 727 with a long-faded paint job. There are private aircraft, too, including a red 1962 Lockheed JetStar JT 12-5 that once flew Elvis, according to American’s staff at Roswell. But most of the planes currently on the ground here have come from American. And for good reason: The airline is phasing out its once-vast fleet of MD-80 and Boeing 757 jets, retiring those older models as part of an aggressive fleet-renewal plan. The retirement of the MD-80 – long the backbone of American’s domestic fleet – has been especially prolific. The carrier once had more than 370 “Super 80s,” as American refers to them, in its fleet. But they’re scheduled to be phased out by 2017, replaced by modern new Boeing and Airbus jets. The airline has been sending its MD-80s to the Roswell boneyard since 2003, with the rate increasing in the past two years to about one retirement a week. The stored planes have become especially important for American for as long as the last MD-80s and 757s remain in its active fleet. Both planes have long been out of production, meaning parts can be difficult to track down if maintenance is needed. This makes their idled brethren in Roswell a crucial link to keeping the others flying. “We store them so we can use the material for the fleet, to keep the fleet flying,” says Paul Bahle, manager of aircraft disposition for American Airlines. While the MD-80 is the current headliner for American at Roswell, the airline retires other aircraft types here too, including 757s and a few 767s. Leased planes are returned “and we sell as many as the owned assets as we can. But as you can see, we keep quite a lot of them out here,” Bahle says. Beyond the business side of the boneyard, there’s plenty of interest in the facility from aviation enthusiasts. “We get more requests for tours than probably Disneyland,” Testorff says, even though the facility is not open to the public. Pat Walsh – the captain on Flight 9780 that brought yet another American MD-80 to “the Boneyard” – has been here previously. Even he’s eager for another look. “And now there are American Airlines airplanes as we’re getting new airplanes and retiring our older ones,” he adds, bringing his visit full circle.